Kohn & Company cufflinks, circa 1925. Last month I wrote about several cufflink makers about whom we know very little beyond the elegant cufflinks they created. This month's note features cufflinks from another "mystery maker", Kohn & Company. 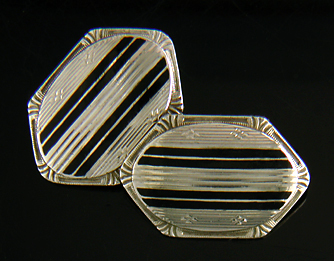 Art Deco black and white cufflinks, circa 1930. Kohn & Company created wonderful gold cufflinks that were designed with a touch of whimsy and fun. While the cufflinks created by firms like Carrington and Carter, Gough are stately in their elegance, the cufflinks of Kohn & Company are just as elegant, but with a lighter touch. I have to confess a fondness for the cufflinks of this firm. Historical information about Kohn & Company is sketchy. The firm appears to have been founded in the early 1900s and ceased operations in the 1930s or early 1940s. Like many of the fine cufflink makers of the time, Kohn & Company was based in Newark, New Jersey. White and yellow gold star burst cufflinks, circa 1925. The firm created cufflinks and other jewels in 10kt and 14kt white and yellow gold. The cufflinks were sometimes set with small sapphires or diamonds. Dark enamels were also used to highlight the engraved designs and borders. Radiant sapphire cufflinks, circa 1935. The cufflinks reflect the broad currents of the Art Deco and Art Moderne design. Occasionally you will observe repeated geometric and linear patterns that are reminiscent of the earlier Arts & Crafts period. The style of the surviving cufflinks and the frequent use of white gold suggest that the firm began creating cufflinks around 1920. Kohn & Company employed several maker's marks. On cufflinks crafted in 14kt gold the makers mark is a cone lying above a slanted "14K" gold purity mark. A variation of this mark has the gold mark "14K" placed inside the broad end of the cone. On cufflinks crafted in 10kt gold the mark is the numeral "10" with a oversized "K" between the one and zero. The mark is usually found stamped on one side of the cross bars or on top of the quad brackets on 14kt gold pieces. Please note, I have not found separate documentation of the 14kt mark shown above. I have attributed the mark to Kohn & Company based on its similarity to known Kohn marks and the shared styles of the cufflinks. This is an area for further research. I am interested in any thoughts from readers. Kohn & Company cufflinks, circa 1930. Recent additions to the Antique Cufflink Gallery include a flurry of striking white gold and platinum cufflinks and a dramtic pair of Art Nouveau cufflinks crafted in yellow gold. Sapphire and Platinum! Elegantly engraved platinum cufflinks set with sparkling blue Sapphires. Beautifully engraved with C-scroll and foliate borders. Crafted in platinum and 14kt gold, circa 1920. Whiplash Vines! Art Nouveau cufflinks of entangled vines with whiplash curves and dramatic foliage. A nice example of the striking, nature-inspired designs of the Art Nouveau era. Crafted in 14kt gold, circa 1900. Anthemion Elegance! Dramatic anthemions (palmettes) and stylized water lilies grace the borders of these elegant cufflinks. An exotic garden or palace courtyard in miniature. Crafted in 14kt gold, circa 1920. Diamond Marquise! Elegant marquise-shape cufflinks with dramatically engraved centers and small sparkling diamonds. Crafted in 14kt gold, circa 1925. Platinum Octagon! Elegant platinum top cufflinks with engraved concentric circles and borders featuring alternate sections of tiered steps and foliate designs. Crafted in platinum and 14kt gold, circa 1920.